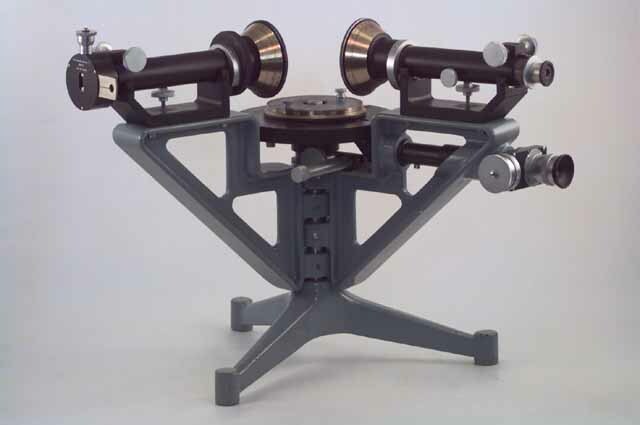 An iron tripod stand supporting two arms, holding a collimator and telescope, and a turntable marked with a 360o scale. The collimator consists of a lens toward the turntable and at the outer end a slit whose size is regulated by means of a screw. The telescope arm can rotate around the turntable and has a second telescope mounted below the main telescope which allows an engraved glass scale on the underside of the turntable to be read. Both collimator and telescope are fitted with polarizers with circular brass scales. Spectroscopy is the science of the determination of a substance's chemical make-up by observation of its spectrum. Light enters the collimator and is focussed by the lens so that parallel light is incident on the prism. The light is then refracted by the prism and its constituent wavelengths dispersed to form the spectrum. The spectrum is observed through the telescope and the angular deviation of the dispersed light is measured. From this the spectrum is determined and chemical analysis of the object being observed can be performed. This spectroscope was used by the Department of Physics at the University of Queensland in its undergraduate laboratories. J.F. James and R.S. Sternberg, The Design of Optical Spectrometers, Chapman and Hall, London 1969.